Makuhari Messe is near Kaihin Makuhari Station on the Keiyo and Musashino Lines. 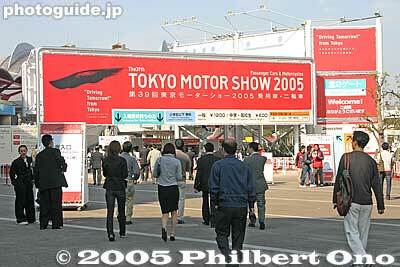 The huge show occupies the entire Makuhari Messe consisting of the North, East, Center, and West Halls, and Event Hall. Admission was 1200 yen. The show sees over 1.4 million visitors. The ubiquitous female companions, attendants, or models that we see today started appearing at the show from as early as 1957. They do not only decorate the show, but they also reflect the fashion of the times. Their hairstyles, wardrobe, skirt length, make-up, etc. The Tokyo Motor Show is not only a showcase for cars, it is also a fashion showcase. Therefore, in this online photo gallery, you will see not only cars, but also women. Enjoy!